Diggin' in the dirt, First strawberry harvest, and bees! So, Ben's grandmother, bless her, was an avid flower lover. She brought in the flowers, artfully aranged, to her church every week. They ALL were from her garden. There are rows, ROWS of these flowers. Our yard is a fantastic, colorful picture during spring. The problem? I absolutely hate them. They are invading our gardening space. They are invading the weed patch (aka front garden to-be). So today I dug some up. I'm hopefully giving them away. In other news, the bees are doing good. They seem to be business as usual, which means the queen is still alive. In that one you can kinda see a few at the opening of the hive, if you look real close. I was a little afraid to get too close because of last week's fiasco. 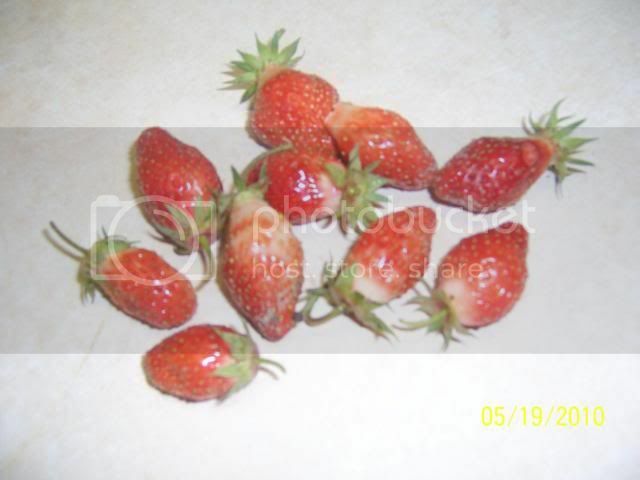 And today was our first strawberry harvest! They were new plants last year so we only got a couple of measly berries, but this year they're in full swing! Here's a handful so far, but there's a TON of still-unripe berries, and a bunch of flowers left too! Other than that, life has been pretty calm lately. This weekend will probably be a chaotic one, because the next few weekends are full! Whew, we have busy busy weeks ahead of us! This weekend is, thankfully, free. Next weekend we have a birthday party. The weekend after that we have a baby shower! The weekend after that I go to the dentist. The weekend after that the girls go to a new pedi! Luckily the weeks seem pretty empty. June 29th summer quarter at school starts. I have three at-home classes. It will feel good to keep learning, even if it's at home! I hope to go back for real classes by winter. Life on the farm chugs along! One of our hens hatched her chicks a week or so ago. Out of 15 eggs, only three hatched. :( I was very sad. She seems to be taking care of them, at least. She protects them from the roosters and feeds them. I love watching natural-hatched chicks. They act so different from hatchery chicks. 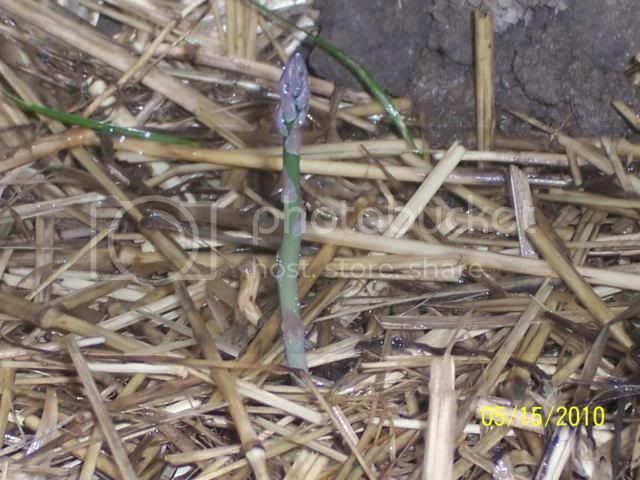 Our asparagus is also popping up, finally! We planted 25 roots a few weeks ago, luckily before the rains set in. 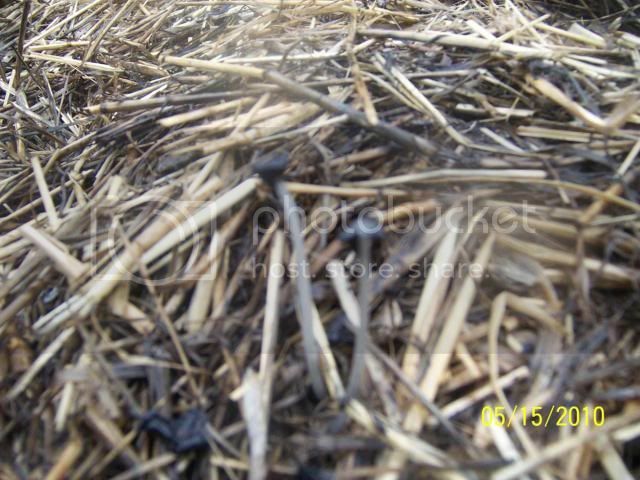 Now I'm sure they've had plenty of water, and we mulched on top of them to keep the weeds out and give them nutrients. 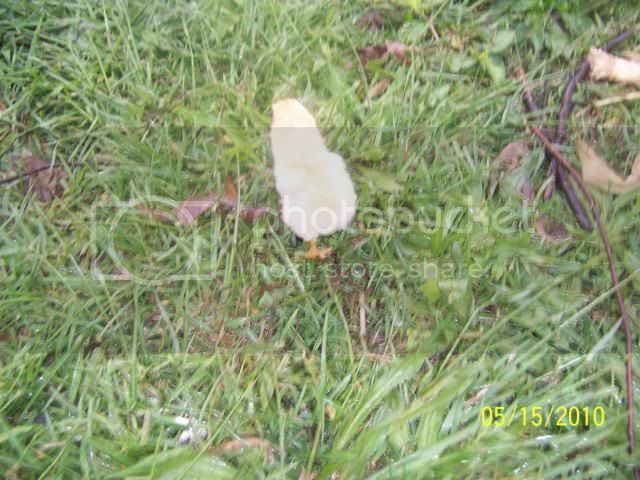 Also in the asparagus bed was some odd looking fungi that I pulled up after I took the picture. First off, I'm allergic to mushrooms, and second off, I didn't want the kids getting into it and chance that it was poisonous. Not sure how good you can see it. 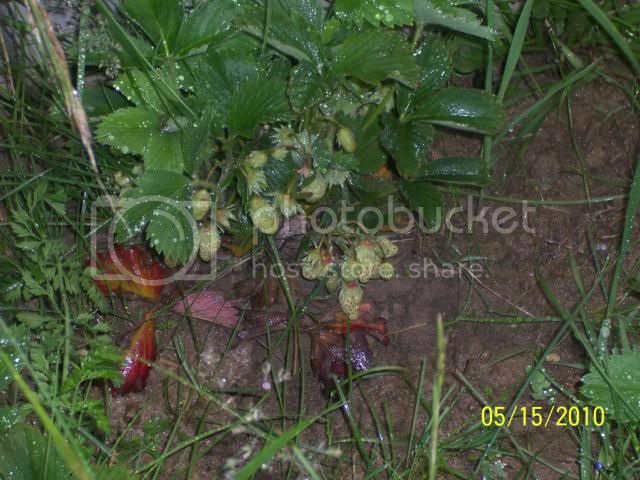 My strawberries are also taking off! I hope to have a good harvest this year, out of the six plants. I'm sure the rain are helping them too! I need to mulch the bed really bad... the weeds are getting ridiculous. So anyway, thats the update from the Doran farm! 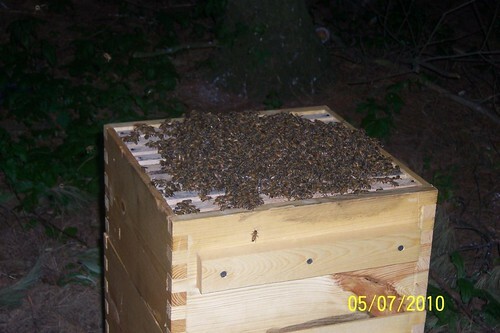 We checked on the bees a few nights ago. They were buzzing in and out of the hive with no problem! Little efficient workers. Female, of course. Then we checked the top to see if we could see anything. They were building! You can see the bright white of the new comb on a few of the bars here. Then we had this BRILLIANT idea of checking on the queen, and taking out the 'queen cage'. Great idea, in theory... pop the cage off, push it onto the next box down, take it out, check for queen. In theory. So Ben took out the nail and it just hung there. We thought there might be a tiny bit of comb stuck to it, so he took his screwdriver and pushed it down. Little did we know that we accidentally broke off a whole freaking comb. A big chunk. 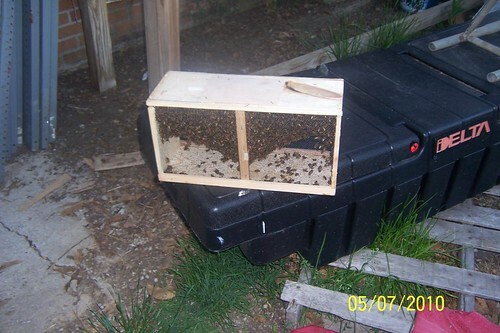 We lifted the top box to find broken comb and some REALLY ANGRY BEES! 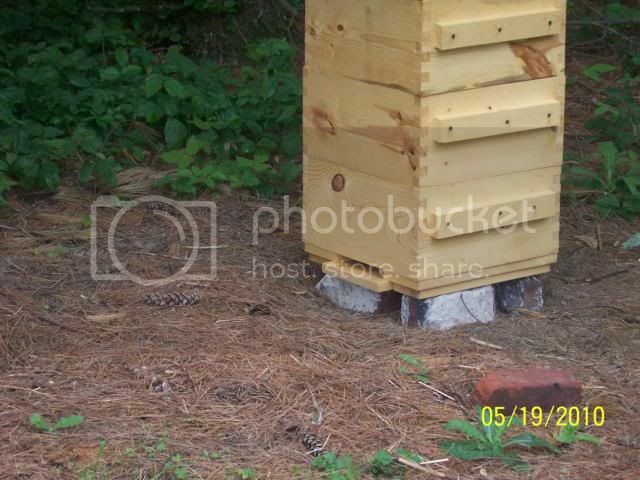 They kinda swarmed out of the hive and came at us.. Ben stuck the box back down pronto, and I ran away. A bee got stuck in my hair, I freaked out and started rolling around on the ground. But nobody got stung! So, um, yeah. 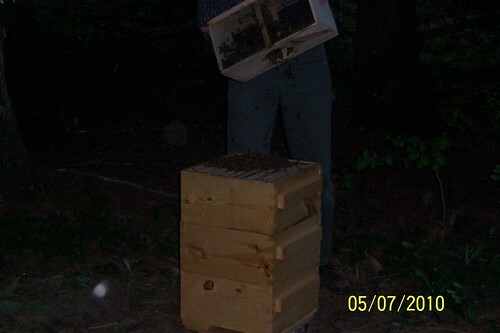 We totally screwed up our fragile new hive. Hopefully they'll tear it up and try to rebuild. I'm going to make this a cut post, because some people are terrified of snakes. This post contains snake pictures! I remember making the egg carton caterpillars when I was a kid, so I figured the girls would like it too! We started by donning our now-dry painted aprons. Then we got out the paint, pipe cleaners, beads, googly eyes, and egg carton. The girls had a ton of fun painting. Then I put Tamsyn down for a nap. This was a bit too hard for her. She painted but had no interest in the rest of it. Morri and I glued on eyes, a bead nose, and sparkly pipe cleaner legs, mouth, and antennae. We stuck some beads on her 'pillar's antennae too. I realized today that I had never posted pictures of the goat kids! How forgetful of me! Nessa and Nicky were born April 16th. Lonnie and Luna followed on the 18th. I wasn't there for Nessa and Nicky's birth, but I showed up about half an hour after they were born. 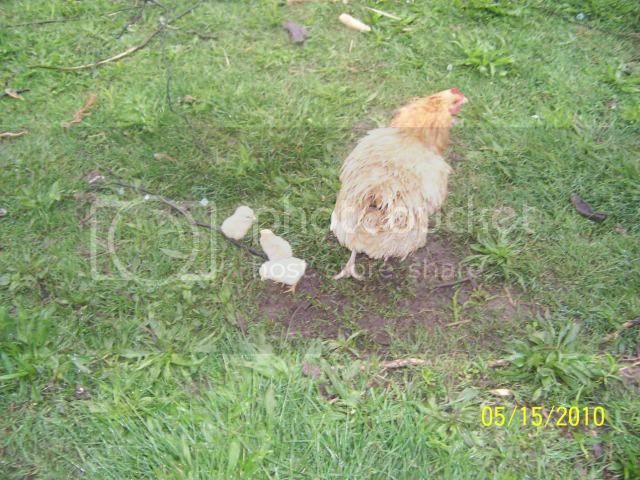 They had a rough start, especially Nicky, because Connie is a first time mom and didn't know what to do with them. We stuffed them full of warm water, stuck them on a heating pad, and used a blow-dryer until they were warm. Nessa is the brown one. She reminded me of a Lioness - hence Nessa. Nicky is the black. Meet Luna and Lonnie! Luna is on top. Lonnie was born first and needed some assistance getting out, mostly because his head is HUGE. Luna came a few minutes later with no complications. The kids go nuts with all the plastic and cardboard we have around the farm. For instance, our rain barrels (that we haven't set up yet) provide hours of entertainment. Luna there is actually standing on top! The kids' balance and jumping ability never ceases to amaze me. Nessa is kind of our fireball. She's not real friendly towards us, mostly because she's just very skittish and high strung. The piles of cardboard we store for our garden (search lasagna gardening) act as a slide. So that's the kids! We were blessed to have two does and two males. We will, of course, keep the does, and they will probably be bred in the late season next year. We will wether (castrate) Nicky as our companion male. Having a male around lets us know when the girls go into heat, even if he's castrated. Lonnie will either be sold or sent to market when he grows a little bigger. We haven't decided. I think I would prefer him to be sold, but the prospect of fresh, grass-raised goat meat is also appealing. More pictures to come, as they grow and play! More and more lately I've been looking into kids crafts, especially creative or logical thinking ones. I decided yesterday that the first step in this direction was getting the girls aprons! At first I wanted to sew them myself, but upon seeing the price of canvas (8.99/yard, seriously? ), I decided to go with the cheapie premade ones ($4.50 for 2). Then we picked out some fabric paint! What a blast! The girls really went for this. It's their first adventure in painting. We started with putting a sheet on the floor. One I wouldn't mind ruining... it was FABRIC paint. Then we laid out our aprons, and pulled out some cupcake papers for paint holders. Then we started! Morri, as per usual, went straight for the purple and pink. Tamsyn surprised me by getting really into the green. I made sure not to interfere (after showing Tams the initial put-paint-on-canvas excitement). Man, they had a blast. It only lasted about half an hour, but it was fun! I decided, this year, in honor of my baby turning 3, I was going to sew her a birthday dress. I am a amateur at sewing. I've done a few simple things a long time ago, like a pillow in high school, a few attempts at cloth diapers, and an apron that is, still, unfinished in my sewing box (but I have the pattern back from my friend so now I can finish it!). So for me, this was a big undertaking. But I figured I had two months (her birthday is in July) to figure it out, and there are a bunch of ladies on a local parenting board who I could run to frantically for help. 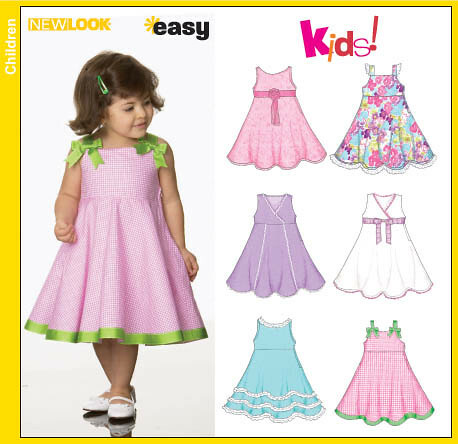 Only the skirt will be paneled, mixed with plain pink and a butterfly pattern Morri picked out. The top will be a light pink that matches the pink panels. The "Easy!" logo on it gives me hope. Wish me luck! I'm hoping to find the pattern at Wal-mart (Joann's was sold out) today and start cutting. Ahhh! I'm Covered in Bees! Now, hopefully you've had a laugh. We got our bees yesterday. Ben brought them home from work. That is, approximately, 10,000 bees. I kid you not. 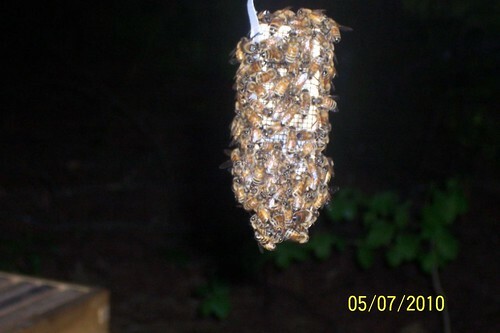 There is a queen stuffed in there, in the middle, where they all seem to be hanging on. I can't tell if you can see this or not, but the top 'row' of bees here are perfectly lined up against the top. 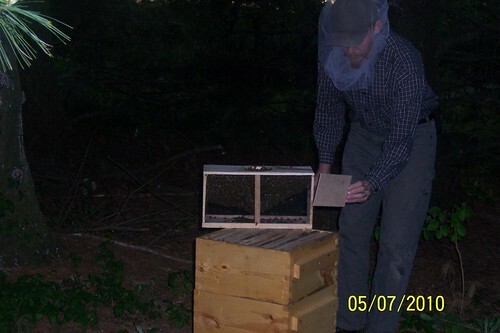 So, we (meaning Ben) set up the hive in the back of the property, then took the bees back. He decided on a veil but no gloves since he wanted to be able to feel things. I bought him a yard of wedding veil (snicker...) from Joanns. The first step was to 'paint' all the bees with a sugar water solution. This makes them eat it, and they gorge themselves and get full and happy. Theory says if their stomachs are gorged, they can't bend enough to sting you. Theory also says the sugar concentration puts them into a sort of stupor. Not sure how much I believe those, but we did it anyway. Then we took out the sugar water can. 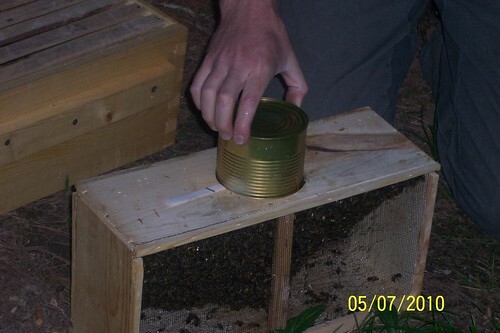 This is what the bees eat when they are in transit, and while they're adjusting to their new hive. There's tiny holes poked in the can so they can get at it drop by drop. The queen cage came next. Queens are always 'caged' because they normally don't 'belong' to the bees in the box. Chances are if they were left loose with the other bees, the workers would kill her because they wouldn't recognize her scent. 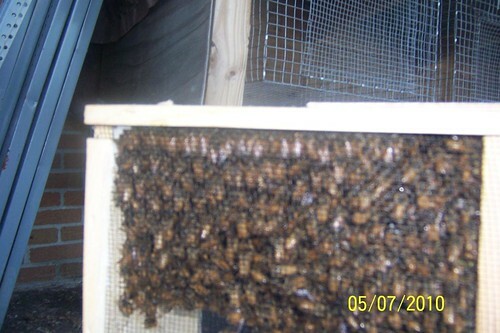 By putting her in the cage, over time, the workers adjust to her and she can take over the real hive when it comes time to install. The queen's 'cage' is plugged by a piece of sugar candy (think: marshmallow) that she slowly eats her way through. It's a gradual process to make sure the workers accept her. I didn't get a shot of the queen herself, because Ben wanted to hurry things along. He attached her cage to the inside of the hive, then got ready to empty the rest of the bees in after her. They fell onto the top of the hive. Look at all the little buggers! After that, it was just putting the hive back together. Sooner or later the bees will realize they have a home, and start building comb. The queen will get out and start laying eggs. 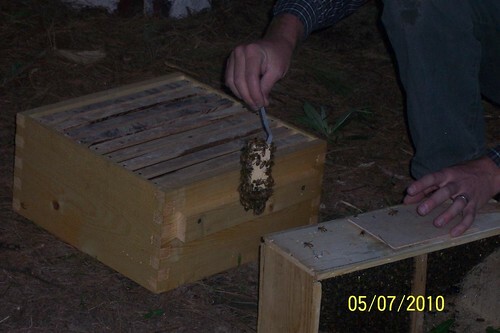 Some of the bees stayed in the box, but they'll make their way in sooner or later. The queen will 'call' them. We're really excited to see what next year brings. 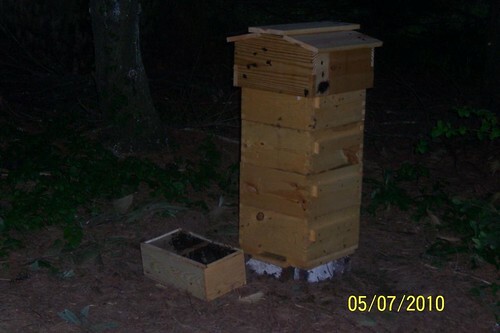 We will leave them alone this year so they can establish good comb and a good honey store to eat over the winter. Next year we'll crack it open and see what we have! The morning started with whiney, fussy babies. Both of them. Morri had a meltdown immediately because I told her we had no pears. Tamsyn couldn't get her breakfast fast enough and screamed the entire time I was making her oatmeal. Neither of them calmed down until I turned on Charlotte's Web (our new library movie) and stuck their butts in front of it with their breakfast. After gulping down a few bites of scalding oatmeal, myself, I decided to try for a shower. Now normally I can do this in the mornings. It takes them 10-15 minutes to eat, and they are content watching a movie/show for that time. I leave the door open so I can hear them. So, I sneak away, get under the water, start washing my hair. Halfway through, I hear a CRASH and know immediately what it is. Corelle dishes have this distinct sound when they break, mostly because they don't just break, they SHATTER. Into a million slivers and pieces. So I run out of the bathroom, hair still all sudsy, to find half a bowl of oatmeal, in pieces, on the kitchen floor, and Tamsyn standing there with a startled expression. I herd the kids into the living room and then stop and just stare for a minute. I didn't know what to do. Barricade the kitchen and finish my shower? Soap was starting to get into my eyes. Clean it up, naked and wet, wrapped in a towel while my hair left driplets of bubbles on the floor? And how did I clean up the gooey, shattered mess, anyway??? Shop-vac? Steam cleaner? Finally I shook myself out of my daze, put on shoes, wrapped my hair in a 2nd towel. I picked up the larger pieces by hand and put them in a tub for later disposal, then used a broken down broom to push the rest into a pile. The broom scraped up a lot of the oatmeal, too, which was nice. Then I wiped down the oatmeal spots that were left and vacuumed well. By this time, the kids were screaming and crying, and I had to remove them from the kitchen once or twice. I was upset and considering taking an Ativan (sometimes it takes my regular meds an hour or so to kick in) and had a headache coming on. Finally it was all cleaned up. I put them back in front of the movie and jumped back into the shower. About a minute later Tamsyn follows me in and promptly slips on the wet-from-me-running-out floor. Smack! She cries because her head hits and I have to get out, conditioner in my hair this time, find her binky, calm her down, and set her back in front of the movie. I hit the shower, again, and quickly finished, lest there be any more disasters. Now Tams is down for a nap and Morri is in the living room. We are woefully behind schedule. I have to pack the kids a bag, pack them a lunch, dress them, stick dinner in the crock pot, finished getting dressed myself, run a brush through my hair. All before noon. Guess I better go get to work.